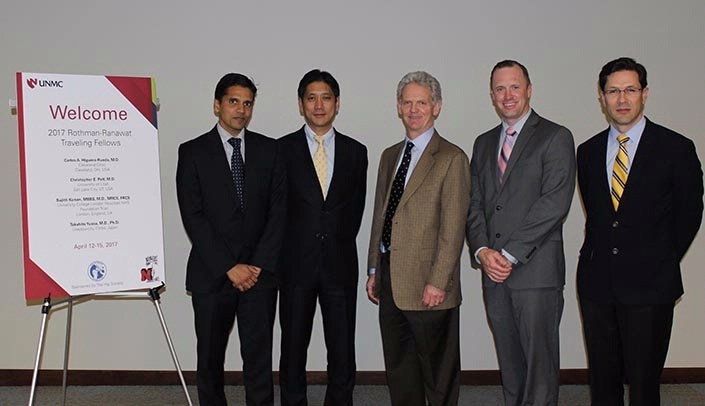 From left, Dr. Sujith Konan (University College Hospitals-London NHS Trust in London, UK), Dr. Takahito Yuasa (Juntendo University Urayasu Hospital in Urayasu, Japan), Dr. Kevin Garvin (chair, orthopaedic surgery, UNMC, and president, The Hip Society), Dr. Christopher Pelt (University of Utah, Salt Lake City), and Carlos Higuera-Rueda (Cleveland Clinic, Cleveland). The Department of Orthopaedic Surgery served as a host site for The Hip Society's 2017 Rothman-Ranawat Traveling Fellowship on April 12-15. The Rothman-Ranawat Traveling Fellowship is open to four young, promising orthopaedic surgeons from North America and throughout the world. Each fellow specializes in adult joint reconstruction and is selected through a rigorous application process. In addition to their stop in Omaha, this year's five-week tour included the following prestigious orthopaedic programs including Washington University (St. Louis), the Hospital for Special Surgery (New York City), the Rothman Institute (Philadelphia), the Anderson Clinic (Alexandria, Va.), the London Health Science Centre (London, Ontario, Canada), the University of Utah (Salt Lake City), the Joint Implant Surgeons' Center (New Albany, Ohio), the Mayo Clinic (Rochester, Minn.), and Massachusetts General Hospital (Boston). The fellows spent two days at UNMC touring the institution, learning surgical techniques from our surgeons and participating in conferences where they presented on various topics including prosthetic joint infection, total hip arthroplasty approaches, and revision surgeries. 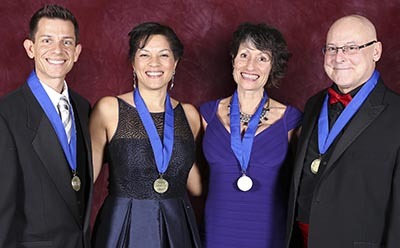 College of Allied Health Professions Executive Associate Dean Gregory Karst, Ph.D., right, with his fellow inductees as Distinguished Scholars and Fellows of the National Academies of Practice. Gregory Karst, Ph. D., executive associate dean of the UNMC College of Allied Health Professions, has been named a Distinguished Scholar and Fellow of the National Academies of Practice (NAP). NAP is an interdisciplinary nonprofit representing 14 health care professions willing to serve as advisors to health care policy makers in Congress and elsewhere. The 14 academies of practice include: audiology, dentistry, medicine, nursing, occupational therapy, optometry, osteopathic medicine, pharmacy, physical therapy, podiatric medicine, psychology, social work, speech-language pathology and veterinary medicine. Dr. Karst was inducted at a March 18 gala banquet in Philadelphia. Senior dental hygiene students at the UNMC College of Dentistry are going out with a bang. The dental hygiene class of 2017 performed remarkably well on their Central Regional Dental Testing Service (CRDTS) dental hygiene clinical licensure examination. CRDTS was held April 28-30, and the class of 24 students achieved a 100 percent pass rate. Nine students scored 100 percent on the exam, while the average score was 97 percent for the Lincoln Division and 98 percent for the West Division. The CRDTS exam evaluates dental hygiene students' specific clinical skills and compliance with professional standards during the course of treatment.